Whether you’re looking to renovate your home or you're starting from scratch on a new property, you will face the big challenge of picking your flooring. In some rooms like the kitchen or laundry room, you’ll naturally go for tiling or linoleum flooring to make cleaning an easier task. As for the other places in your home, you can get more creative. Hardwood floors, tile, or carpet are all great options, but it all depends on the look you’re going for. If you decide to go for carpeting, this article from Utah County Cleanpro will help you pick the best carpet to fit your lifestyle. When you dream about your perfect home interior, you spare no expenses. Unfortunately, in real life, you’re limited by a budget. Your carpet type and style will depend on how much you can afford. Start out your search with a budget. Shop around to find the carpet that best fits your lifestyle and means. When you ask for the price of the carpet, be sure to ask the supplier to give you separate pricing for materials and installation and if there are any additional fees. Some extras are worth splurging on, such as a stain-resistant treatment for high foot traffic rooms. Underneath every nice carpet, there’s high-quality padding. Your carpet needs a solid foundation for support and extra cushioning. You aren’t able to see the padding, but it doesn’t mean that you should skimp on it. Consider that the padding can prolong your carpet’s life and prevent the backing and fibers from coming apart as time passes. 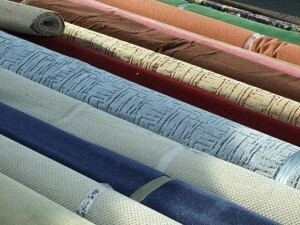 Carpet padding can be made from rubber or foam materials. Talk to your carpet manufacturer about the best option for your carpet. Carpet comes in many styles to fit any budget. You can find plush, Berber, frieze, and textured carpets. All of those terms refer to the carpet’s pile, which is the surface you can see and feel. You shouldn’t focus on how a carpet looks or feels, but how it fits your lifestyle. Plush carpets are thick and cozy, but they show footprints and vacuum tracks. Saxony is similar to plush, and it’s recommended for low foot traffic rooms. Berber carpeting is perfect for high foot traffic areas because it doesn’t show tracks or most stains. Take some time to learn about the many different carpet piles and their best uses before committing to a carpet. No matter what carpet style you choose, you will need to have it professionally cleaned once a year. Call the carpet cleaning experts in Nephi, Utah County Cleanpro at (801) 884-8762. They will know how to care of your carpet. Once you decide on your carpet style, you have an even harder decision to make: the color and pattern. The color can change the whole mood of the room. Do you want your carpet to make a statement or would you prefer it to fade into the background? Before you choose a color, ask for samples and examine them at home in natural light. Keep in mind that constant exposure to sunlight can make the colors fade. You need to choose your carpet depending on the room where it's going to be. As an adult, you can be trusted to be cleaner and get a more luxurious option for your bedroom than a child can. Living rooms require something more robust that can stand wear and tear. Consider the use and foot traffic the room receives to make a better decision. Everything in our home has an impact on the environment. Carpet, padding, and the adhesive used on them are no exception. They can seriously affect your air quality and health. Instead of going for synthetic materials that contain VOCs (volatile organic compounds), go for carpets made from natural products. You can find options made out of wool, jute, and other natural materials. You can also get colored carpets that use chemical-free or organic dyes which won’t release toxic fumes. If you want to reduce your impact on the environment, you can search for a carpet made out of recycled materials, such recycled water bottles or recycled carpets and rugs. To extend your carpet’s life, you need to vacuum it regularly and have it professionally cleaned once a year. Call Utah County Cleanpro at (801) 884-8762 to schedule your carpet cleaning appointment.